The Jeanneau 46 is French, it's stylish, elegant and not over done. 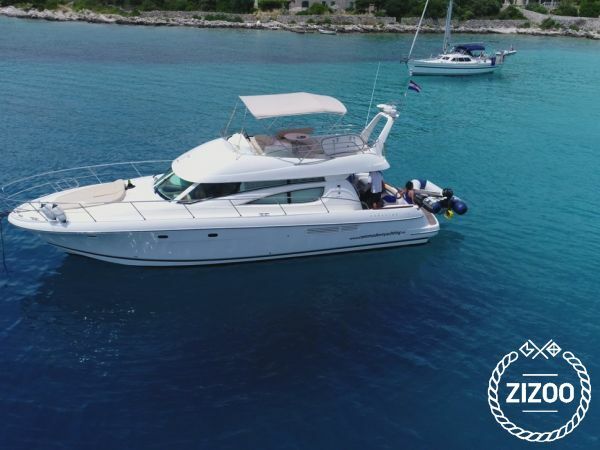 The sleek lines of the hull and the split-level cabin windows are distinctively Jeanneau. There is only so much that can be done with the interior of a 46-foot boat, but the design team has come up with something special on this Jeanneau. Clever use has been made of mahogany woodwork, cream leather and stainless steel to create a modern, elegant ambience. There is the usual lounge with a foldout table and bench seat opposite. The adjustable table can be taken out quickly by undoing a couple of large thumbscrews. An entertainment centre has been incorporated neatly into the back of the staircase to the upper deck on the port side. The cabin is finished off with Venetian blinds on the lower windows and curtains on the top. A wooden, inlaid star feature breaks up the cabin roof lining effectively. Although the floor is laid teak and holly, the test boat had carpet, which added to the warmth of the cabin. The galley is set down slightly, but still remains part of the main cabin, so anyone working there won't feel left out of the party. It's a unique design with two stainless hand rails either side of the entrance and a glass-serving top. It comes equipped with a cook-top and a small range hood to take away cooking smells, plus a microwave and deep drawers for plates and glasses. A neat feature is the integrated fridge door to match the surrounding cupboards and the baskets in the floor storage lockers. The lower helm station is slightly raised, but it still remains part of the cabin. There's a seat for two people and a full set of instruments mounted in a large burl console, with a smaller one in front for the plotter and autopilot controls. The Volvo Penta EDC controls are mounted on an angle and fall readily to hand, while the switches for the genset and shore power are set under the console under a protective Perspex cover. Also incorporated in the console is a glove box, with a Perspex cover and a solid stainless steel fi ddle rail that doubles as a handle for passengers to hang onto. Opposite the helm station is a small dinette the same height as the driver's seat. The table is set on a stainless frame and has a couple of handholds that are useful when stepping up to the seats. Now for the big surprise! There are three cabins - four if you count the European style crew quarters aft under the circular lounge - with double berths. Not bad for a boat under 50 feet. The island berth in the owner's cabin has a slotted base and lift s up on a gas strut to get to the storage underneath. There's a couple of drawers under the bed that are so deep the cabin door needs to be closed to pull them all the way out. The berths in the guest cabins can be separated to form single bunks. There are his and hers lined hanging lockers in the owner's cabin and the ladies will love the full-length mirror on the back of the bathroom door that opens into the cabin. There are two bathrooms featuring showers with circular screens. Up top, the entertainment area is large. A big sun-pad lifts up to form a second seat around the circular table. There's also room for the driver and a friend at the upper helm station. PERFORMANCE The figures were recorded on the Gold Coast Broadwater in against a two-knot ebb tide using a GPS unit. 17.5 knots @ 2000 rpm, 26.2 knots @ 2500 rpm, 27 knots @ 2700 rpm SPECIFICATIONS LOA: 14.55m BEAM: 4.36m DRAFT: 1.2m DISPLACEMENT: 12,688kg FUEL: 1530lt FRESHWATER: 570lt SLEEPS: 6-12 WI-Fi, Dinghy with Outboard engine available on request. Experienced skipper can mingle with you or leave you in private, if you need it. High references with all of our guests.